Since we were old enough to remember, we’ve all been asked the question “What do you want to be when you grow up?” When we were little, we dreamed big. We thought we could be anything — firefighters, artists, engineers, doctors — and were excited about the prospect of the freedom that comes with adulthood. But does this childlike passion carry into adult life? Are people doing what they love and excited about going to work everyday, or are they simply going through the motions? To find out, we surveyed 1021 adults between the ages of 25 and 64 and asked them “Does your work excite you?” 45.5% of those surveyed said no, so we took a look at the data and determined how certain factors influence workplace excitement. 57.8% of the 25-34 year old age group were excited about their jobs, which was above the U.S. average of 54.5%. This may have to do with the stage and flexibility of their career. Typically, 25-34 year olds are still in the process of developing their careers. Their median job tenure is 3 years, so many of them don’t have time to get bored with their jobs. The fact that 25-34 year olds have less to worry about than older age groups may also contribute to their excitement. They are not as tied down as previous generations – the average age of first marriage in the US is 27 for women and 29 for men compared to 23 and 26 in 1990 – giving them the freedom to travel with work and go to conferences and networking events without yet having to worry about taking care of a family. More young people also live with their families. A study by Pew Research Center shows that now only 67% of 18-34 year olds live independently – this age group was more likely to live independently during the Great Recession! Those that do not live independently save the 30% of their paycheck that the average person spends on rent, so not only can they be more flexible about their salary requirements, they can also focus more on saving for the future. Urban environments are both stressful and exciting. They’re fast-paced and crowded, motivating and intimidating, and, according to the survey, the place where people are most excited about their work. Looking at workers between 25 and 64, 57.1% of urbanites were excited about their jobs. Unlike in the past, where people lived in the suburbs and commuted into the city, more and more people are opting to live near city centers where they have shorter commutes, easier access to shops, restaurants, and entertainment, and more diverse job opportunities. For the first time in recent history, employment is growing in the urban core and declining in the suburbs. 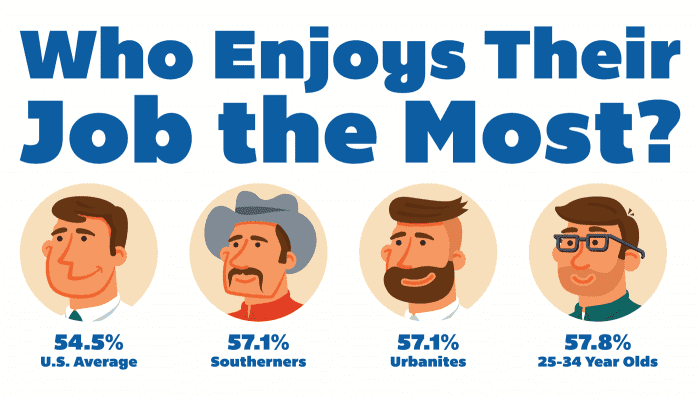 Overall, people in the South were more content than people in any other region – 57.1% of people were excited by their work. Though self-perceived happiness and job excitement are not directly correlated in this survey, a 2014 study by the National Bureau of Economic research showed that self-perceived happiness was highest in the South, namely Georgia, Louisiana, and Texas. The fact that people are excited about their jobs may contribute to this happiness. Other factors that may weigh heavily on work excitement, and are important to keep in mind in addition to those mentioned above, include friendly colleagues, a positive work environment, the opportunity to learn and grow, a voice in the company, and the ability to make a difference. Though there isn’t a formula for the perfect job, there are many things you can consider as you think about where your career is going next. Rekindle that childlike imagination, remember what you’re passionate about, and seek out ways to incorporate those passions into your job. Find an environment where you can learn, grow, and meet great people. And maybe, if you’re feeling like you need a big change, head South.